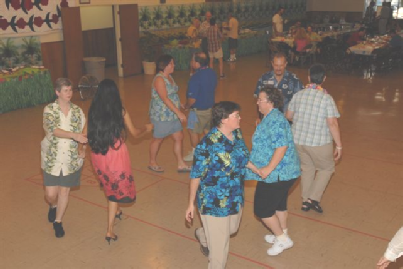 It is difficult to capture in words what Golden State Squares is about, so we have put together a collage of photos of some of our members at various events. We hope you enjoy them. As a courtesy, we ask that you don't reuse these photos for other purposes without our permission. Thanks! 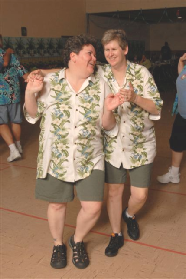 Heidi and Sarah dance at their wedding reception. Aren't they cute together? Guests at Heidi and Sarah's wedding reception. Was that circle left or right? 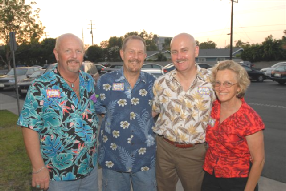 Jim, Steve, Brian and Lizbeth take a moment to pose for a quick photo-op. 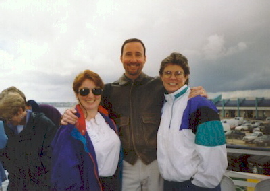 Donna, Marc & Cathy keeping each other warm on the San Diego Harbor cruise during a Pass-the-Sea fly-in. "Let's go cruising!" 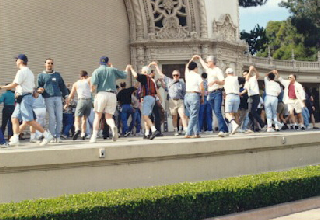 Dancing at Balboa Park in San Diego during a Pass-the-Sea fly-in. "Hey, do we get paid for this?" 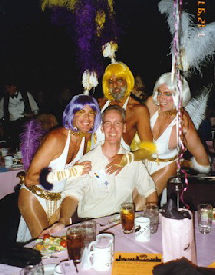 Jim Bishop, is visited by Dia Rhea, Gono Rhea, and Pizza Rhea at the international convention in Las Vegas. "Someone needs to introduce these gals to epilady!" 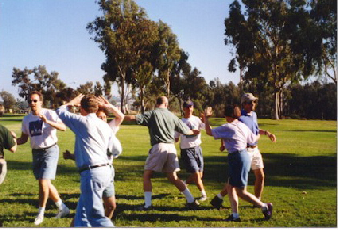 Dancing at Mason Park in Irvine during a summer picnic. "What kind of sack race is this?" 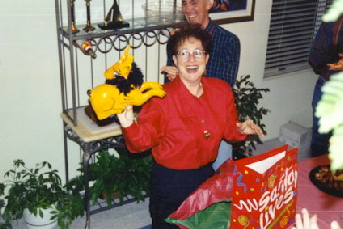 Fabulous gifts from our annual white-elephant party! "How did they know I collect these?" 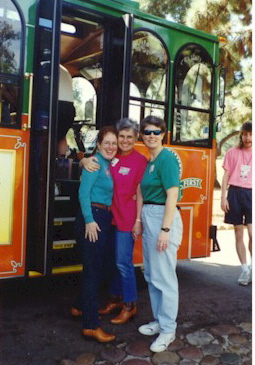 Susan, Judy & Cathy ready to board a trolley during the San Diego Pass-the-Sea fly-in. "Where can we find some really good Rice-a-Roni?"